Antelope Canyon, One of the many and predictability most well known slot canyons outside of Page, AZ on the Navajo Reservation. 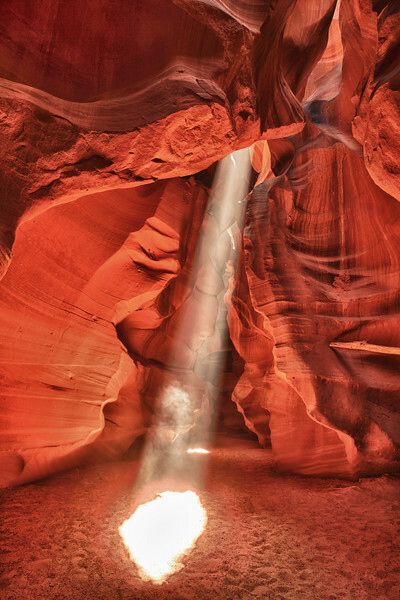 A slot canyon is one that might be about 1-3 feet wide at the top, 100 feet deep, and 6-10 feet wide at the bottom. Formed by millions of years of flash flooding through the soft sand stone, it is known by the deep subtle tones of reds, grays, and yellows. At certain locations, in certain time of the year, the sun's beam streams down into the canyon, making it almost magical. (see latter pictures). I also included a couple of pictures with other people in the canyon to give a sense of proportion. Note the "Map this" button at the top right. Select a picture, hit the button, and you will be taken to the spot where the photo was snapped. Enjoy!